From left, down, then right: Doug DiPasquale (Verso) and Chris Hollingsworth (Spruce Mt Elementary School) accept their respective 2019 Community Change Challenge trophies; Shaun Riggs, The Dugout Bar & Grill accepts his Corporate Champion Circle certificate; candid shot of attendees. Right: Gary A. LaGrange Community Impact Award recipient, Shannon Smith of Wilton. 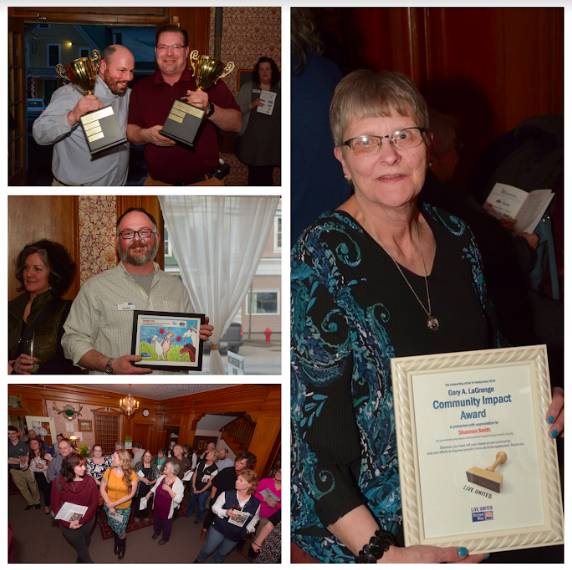 KINGFIELD - United Way of the Tri-Valley Area recently held its Campaign Celebration and Annual Meeting at The Herbert Grand Hotel and McGregor’s Pub in Kingfield. The annual meeting was sponsored by Poland Spring, Riverbend Property Management and Dead River. Almost 100 people were in attendance celebrating the year’s campaign. United Way is currently at 88% of the goal of $725,000 in cash, grants, goods and services and there is still time to help us get to 100%. 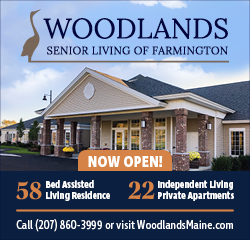 All of the funds raised in Franklin and Northern Androscoggin Counties are reinvested right here, benefiting our seniors, children, abuse survivors and so many more. You can make a donation right on-line at www.uwtva.org/give or mail a check to PO Box 126, Farmington, ME. The evening kicked off with a welcome from Rob McGregor, owner and continued to celebrate the many awards given. United Way benefits greatly from area organizations and individuals. The Gary A. LaGrange Community Impact Award was also presented. For this award, there were 9 nominations and the decision was a difficult one. Shannon Smith, of Wilton was selected to be honored for all her work with the Wilton Blueberry Festival, the Emblem Club, the Farmington Horsemen’s Association, the Franklin County Chamber of Commerce, and the Farmington Rotary, to name a few. Community Change Challenge trophies were awarded: Tier I winner was Verso, raising over $3,000 and Tier II winner was Spruce Mountain Elementary School, raising over $1,500. The money raised in the 2019 Community Change Challenge Additional by 21 local businesses totaled $6,915.90, proving once again, that a little bit from many adds up to a BIG difference! Blossom Award (individuals, businesses newly supporting United Way): Alpha Phi Omega (at UMF service fraternity), Arleen Masselli, Leah Brackett, Maggie Leone, Mary Ellen Simon, The Children’s Center, and The Wood Mill of Maine. The Green Thumb Award (members of the media that have helped United Way grow): Ben Hanstein, Daily Bulldog and Anne Sheehan, Sun Media Group. Mother Nature Award (those who have significantly collaborated with United Way): University of Maine at Farmington, Literacy Volunteers, Farmington Farmers Market, Teacher’s Lounge Mafia, SWARM (Strong Women Advancing Rural Maine), and Western Maine Transportation Services. As part of the annual meeting, a new slate of officers was put forward and approved: President: Shaun Riggs, Vice President: Becky Davis-Allen, Treasurer: Chris Hollingsworth, and Secretary: Mathew Fournier. United Way is appreciative of the very active 16-person board that helps to guide, direct, and promote the various activities of United Way. For more information about United Way, call (207) 778-5048, visit www.uwtva.org, follow them on Facebook (www.facebook.com/uwtva) or visit the office at 218 Fairbanks Rd. Farmington.